Need some magic in your life? And from that point, her inner world figures present themselves to her. Hannah, her messy disorganized Earth Mother, tells her that her spirituality has been “all in your head” and to open her heart. Her Passion first appears as an anorexic indifferent young woman who can’t focus her attention. Her Child, a ten-month-old baby boy, needs nurturing. With humor and compassion, these inner world figures challenge Anne to listen. By doing so she discovers a peace and creativity she has not previously known. 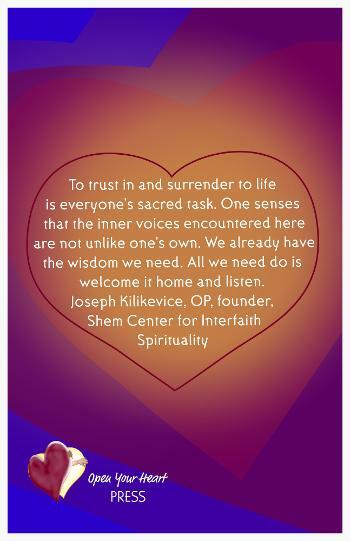 Open Your Heart appeals to women and men, young and older because it reminds us that surrendering to our own inner guidance leads to a life of passion. We already have the wisdom we need; our challenge is to listen and trust. I really liked this book, way more than I expected to! 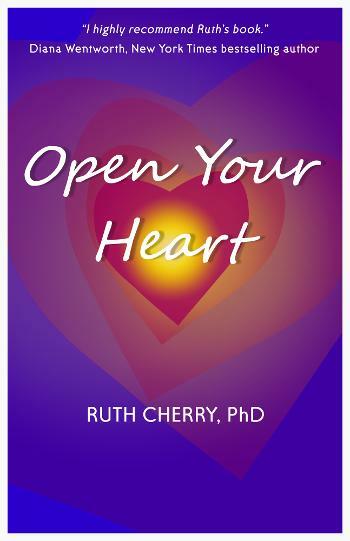 Tight writing, riveting, fully-fleshed (if only imagined) unique characters and a candid, profound truth that rings throughout the course of the book, “Open Your Heart” by Dr. Ruth Cherry shows the good, the bad, and the power of human nature and our ability to overcome and change. We don’t have to stay stuck in an unhappy rut, we have the power within ourselves to change things if we just look and listen. It kept my attention the entire way and I could totally see this being a series if she wanted to, with different characters (like Anne) going through different life changes. It was easy and fun to read, and it’s the kind of book where you are gaining valuable insight and enlightenment, even if you don’t realize it at the time. This is more of a character-driven book that touches on emotional and psychological and spiritual and is best geared towards adults. “Open Your Heart” was great!! Ruth Cherry, PhD has the ability to keep the reader totally engaged throughout the entire story, and that is no small feat considering the unorthodox storyline, the diverse set of characters that come and go, and the fact that this isn’t really a traditional novel with action, plot, consequences, high stakes, etc, but more of a personal, spiritual journey one woman goes on, and her experience, in turn, becomes ours… You want to keep reading it but at the same time you have to stop to think about it all and let it sink in as it is intense in the subject matter at certain points, and heartwarming and charming and downright depressing at other times. I’d love to read more from Dr. Cherry someday. Great insight… great writing… great storylines. Fantastic! Warning…when starting this book make sure you don’t have anywhere you need to be or anything you need to do because you won’t want to stop reading until you’ve finished it all!! Trust me on this! The book starts off with an enticing, humorous-yet-serious beginning and just keeps going from there as the thread of Anne’s life continues to unravel and gets put back again. I like how as each chapter progresses we are able to see almost a bird’s eye view of each different character as they play their role in the story. The characters were genuine and believable, (even if they weren’t “real”), and I think what I liked the most about this book was that it really held nothing back in terms of facing head on some emotional barriers and problems many people face, but maybe don’t want to admit it. It shows how we all have the power inside to overcome as long as we are willing to face the issues head-on. But the story is done in a fun, almost campy-feel with some of the conversations and scenes. The best part about this book in my opinion really was the unique and creative characters that were a nice departure from the stock, standard figures we so frequently see. Felt like I learned a lot. Recommend. I totally enjoyed this book way more than I thought I might, even though I liked her other book, I LOVED this one! It was really weird and trippy and I totally mean that as a compliment. Read this with an open mind and heart and just receive the story and its lessons, don’t try to make it something that it isn’t. This isn’t some high stakes, thrilling action adventure or grand romance. It is about a woman who takes a sort of existential journey with some very unique and profound characters who represent different parts of herself and help her learn to be a better, more open person. I like that this was insightful to the human condition but is entertaining as well. Love the conversations, and there were so many interesting concepts that made me think of some situations in my own life. It has a sassy quality that made it feel more ‘fun’ even though the plot got deep and profound at times. Suitable for teens on up and there are a ton of great one-liners in here that I want to copy down for future reference! First, I have to say that I don’t normally read books like this but I’d read a book by this same author last year (“Living in the Flow”) and it was truly incredible reading and a moving, eye-opening experience. I was looking for something out of my normal routine so I thought I’d give “Open Your Heart” a shot, even though it’s a slightly different style of book… Color me impressed!! I loved that this was a fiction novel, yet still had all the ingredients of a self-empowerment guide or a self-improvement book. Just so loaded with interesting insight and wisdom along the way wrapped up in a fun and entertaining story with delightful characters! There is such strong, vivid writing, and I appreciate that the main character Annie is so relatable and down to earth, but is flawed, and going through real transitions we can relate to. Liked Hannah, Theresa, Maggie, Rob…and all the others…Everything just felt “authentic” for lack of a better word. Dialogue, interactions, scenes, descriptions…I like that it was really unpredictable and we get to see the story from lots of angles. . . a very good read that I’d recommend even to those who don’t normally read this sort of thing…try it, you’ll be pleasantly surprised! I thought that his book was really cool. Super different from most types of ‘self-help’ books out there – it is delivered as a fiction story, but it feels real like it’s a documentary of Annie’s experiences. It feels like a mix of fiction/nonfiction and since the author is a psychologist (among other things) she uses her expertise in helping humans to understand their personal issues better in a way that we can relate to, and even enjoy. The characters were all interesting and well-written, and seem like they really each had a good role that helped shape Anne’s personal growth journey. Fast paced and engaging, it all came together seamlessly to tell an introspective, inspiring book that will affect your mind and “Open Your Heart.” Recommend for readers of literary drama, spiritual fiction and self-improvement.